I was recently given the opportunity to sample the fruit bouquets from 1-800-FLOWERS. I received the mixed berry margarita, above, from the Charlotte location. To order in Charlotte, you can call the store directly at (704) 910-1199. 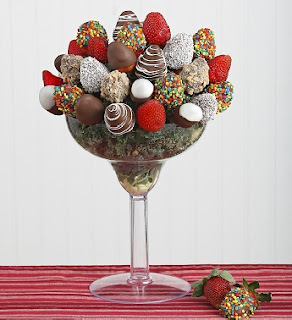 Of course you can call 1-800-FLOWERS.com or go to their website to have fruit bouquets or flowers or other gifts such as cookies, popcorn and candy delivered anywhere they serve (most states). The berries presented as a beautiful bouquet - very impressive and tasty, although I would love to see a dark chocolate option - these use milk and white chocolate and various toppings including sprinkles, coconut and ground toffee. This is a unique gift in lieu of traditional flowers and can be delivered the same day they are ordered. Il Diavolo (back half) and San Gennaro (front). The Il Diavolo was spicy and one of our very favorite menu items! Soon after moving back to Charlotte in 2012 I visited the Ballantyne location of Libretto's - post here. Now a third Charlotte location at Parktowne Village (corner of Woodlawn and Park Rds.) joins Ballantyne and Epicentre. I recently had two very enjoyable meals at Libretto's - Parktowne and even had the opportunity to speak with owner Mike Libretto about his restaurants and the restaurant business here in Charlotte. All of the food was good and the atmosphere at this location is pleasant, nice for couples and families with a bar available for single diners as well. The eggplant parmigiana remains a personal favorite. However, this was my first time trying the pizza and it was also very good - so many delicious specialty pies to choose from. My husband and I both love spicy foods so the Il Diavolo was right up our alley with pepperoni, spicy sausage, jalapenos and roasted garlic - yum! The stuffed mushrooms were also fantastic as an appetizer and we enjoyed the linguini with clam sauce as well. The best news is that this new location delivers to where we live - awesome! I look forward to returning to Libretto's to try more soon, including the wings, Square pizzas, Calzones and Strombolis. Neat bar/outdoor area. When the weather is nice you can sit outside overlooking the fountain! Half of a Roasted Beet Salad - kitchen was nice enough to split this for us. Linguini with White Clam Sauce - garlicky and delicious! Florentine (right half) and New Yorker (left). Display of pizzas and garlic knots. Easy to stop in for a quick lunch. Tasty garlic knots with the wonderful tomato sauce. Stuffed Mushrooms with sausage in a creamy alfredo sauce - so good! Eggplant Parmigiana - a beautiful rendition and still one of my top picks. Eggplant Rollatini - awesome appetizer - would be enough for small appetite meal. Side of meatballs. Must try. The baby also loved these! Cannoli we tried was good! Tiramisu, cheesecake and a brownie are also available to satisfy the sweet tooth.